There are many things to think about when choosing a WordPress theme, and one major consideration nowadays is how the theme works in mobile devices. If you choose a theme that is responsive, your website will be beautifully displayed for all users, whether they are on laptops, tablets, or mobile phones. But how important is responsiveness? According to a report by TechCrunch, far more people access the internet on mobile devices than computers. So if your blog is not responsive, you are essentially telling more than half of the internet that your site is not for them. And then there’s SEO. Search engines love responsive sites. You can thus expect to enjoy more search traffic if your site is mobile friendly. If you already have a site and it’s not mobile friendly, then you have to change that now! Your mobile traffic is going to someone else with a more optimized website while you wait for desktop hugging geeks to type in your url. But the good news is, there are now so many free, responsive WordPress themes that you would be spoilt for choice. To make things easy for you, I have put together a list of some of the best. Of course if you feel there are other themes that are free, responsive, and well designed, I’d love to hear about them in the comments below. Pixova is a single page, parallax theme. 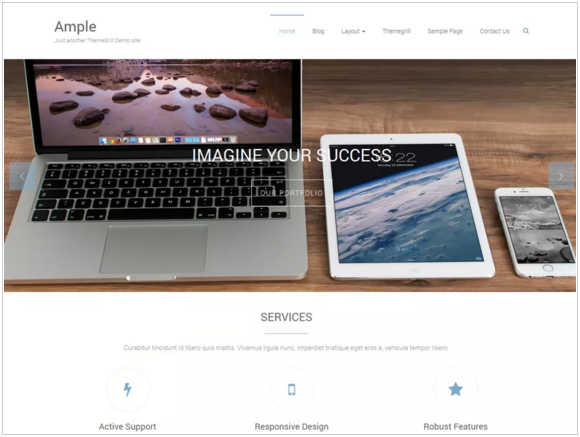 If you want to represent your business with a one-page theme, then you should absolutely check out the crisp and beautiful design this theme offers. You can add images to the header area and turn them into sliders, and that’s just one of the convenient features. Pixova also features those beautiful animations that make a one-pager come to life. And you can be sure of the basic customization options you need to make your site look different, like custom headers, colors, and menus, and different layout designs. 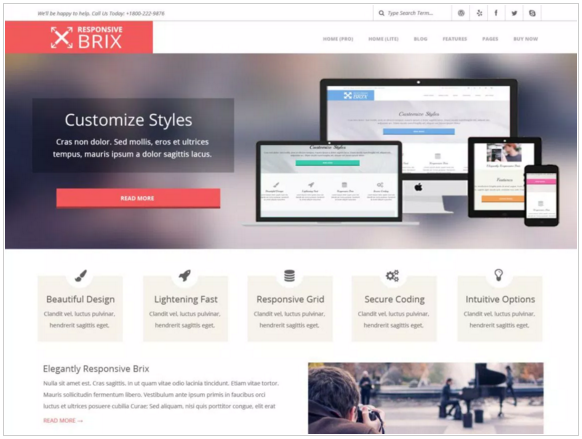 Responsive brix is a lightweight theme with modern, bold design. It offers many customization options including various design layouts, beautiful image sliders, many font icons, various color options, and much more. This theme is created with HTML5 and CSS3 which means you can expect modern, clean design that may even help your SEO efforts. Just looking at this theme, you can quickly see why most users give it a 5 star rating. 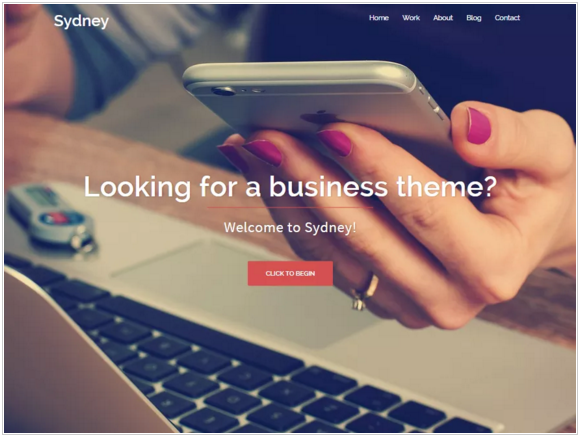 Sydney is a business theme with features that can help you create a professional site pretty quickly. Taking advantage of the construction blocks in this theme, you can easily design an engaging landing page for your business. Sydney provides many customization options including the ability to change color schemes, control your blog layout, upload logo, create full screen slider, upload header image, and so much more. If you plan to create a business, portfolio, or blog style website, Spacious will work great for you. This theme features a neat design that indeed makes your website look spacious. Spacious offers various customization options for the design, layout, and color of your blog, with which you can really make this theme look unique on your site. Interestingly, although this theme is free, the makers (Theme Grill) explicitly promise to support people who use the theme through their forum. Kudos to them! Colormag is a beautiful and responsive magazine style theme. If you want to create a news, magazine, or publishing blog, then you seriously need to consider this theme. 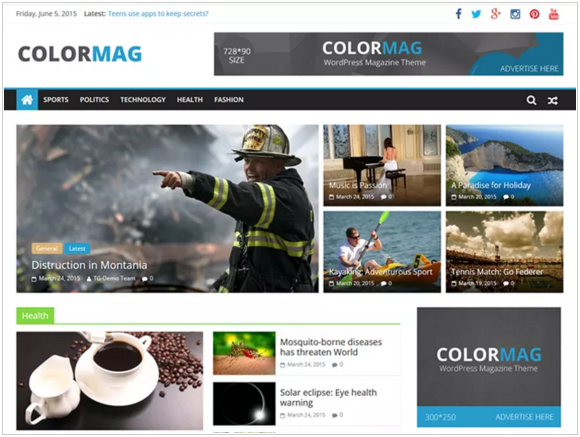 Colormag offers many features and customization options which include custom background, custom colors, custom menu, left and right sidebar, translation readiness, and much more. 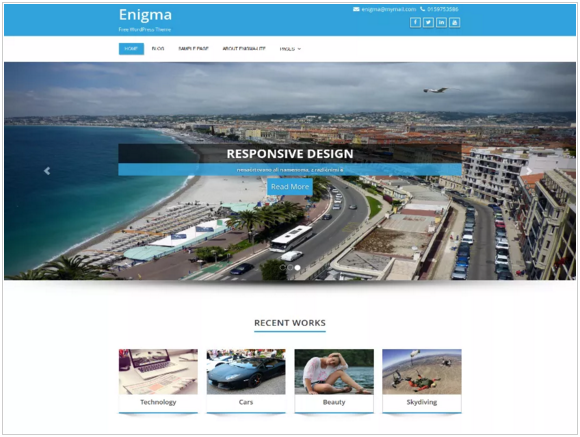 Enigma is a multipurpose, responsive theme that is great for business, portfolio, blogging, and other types of website. Beyond making this theme responsive, the developer also ensured it supports all leading browsers. Enigma provides social buttons and links in your header and footer area so you can easily link your site to your social profile and create social buzz. 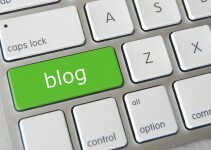 Enigma offers sufficient customization options to make your blog look great. If you want a theme that offers truly clean, clutter free design, then this theme was created for you. Attitude is a clean, responsive theme that adapts to different devices. This theme offers options for customizing many parts of your blog, including the general site layout, post layout, site background, site header, custom menu, custom logo, and so much more. Attitude offers 11 social icons, so you can get all the social media buzz your site needs to succeed. 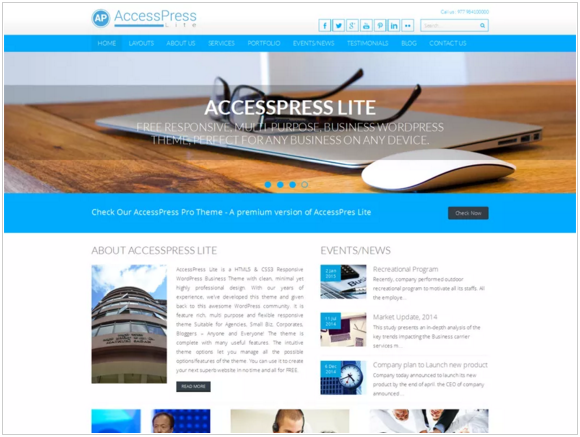 AccessPress is a responsive WordPress theme with a clean and professional design. This theme offers a remarkable amount of customization features. For example, you can customize the site structure using a blog, portfolio, testimonial, gallery, or events layout. 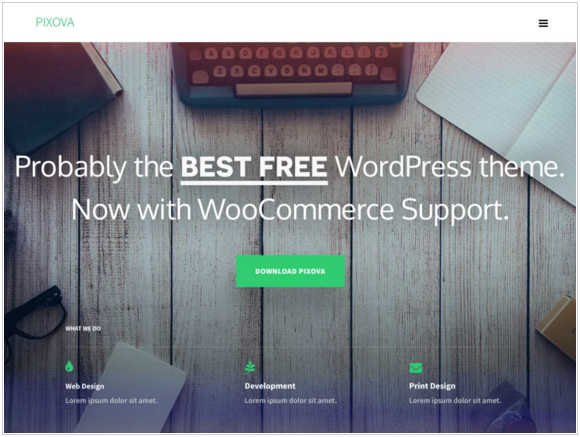 Besides the power this theme gives you to control the layout of your blog, it also provides other business friendly features like WooCommerce compatibility, and the option to use a French, Japanese, Danish, or Persian version of the theme. 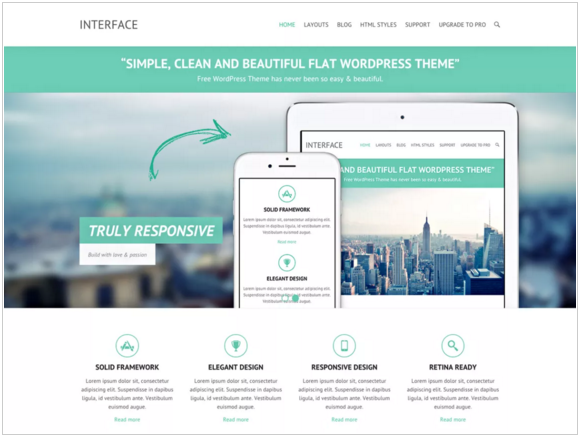 Interface is a responsive WordPress theme created by Themehorse. It’s quite surprising that this theme is free, considering how clean and professional it looks. Interface offers many nice features such as 4 layouts for every post or page, 5 page templates, featured slider to highlight a post or page, 8 widget areas, 10 social icons, and much more. 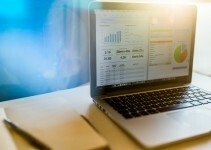 And when it comes to customizing your blog, Interface provides the options you need to get this done. You can easily add a custom background, header image, logo, and more. 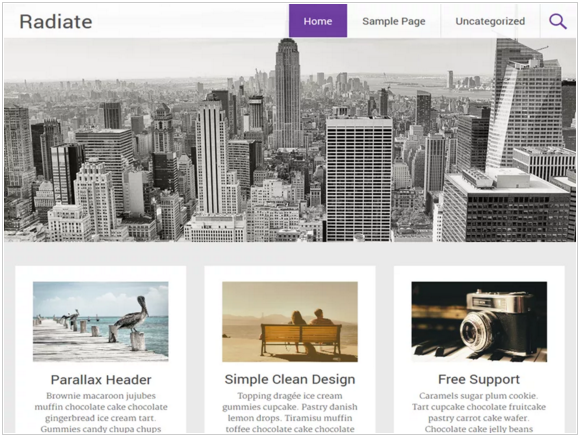 If you want a feature rich, powerful, and customizable theme that is also lightweight and fast, then this is the theme for you. 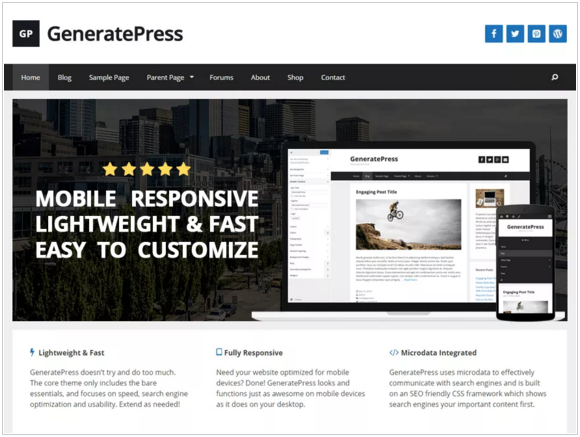 With GeneratePress, you can design your blog the way you like using the Customizer which displays the changes you make even before you publish. You can easily customize the header, menu, color, layout, and so much more. GeneratePress also incorporates coding standards that could improve the SEO of your site, such as W3C Validated Markup and Schema.org microdata. 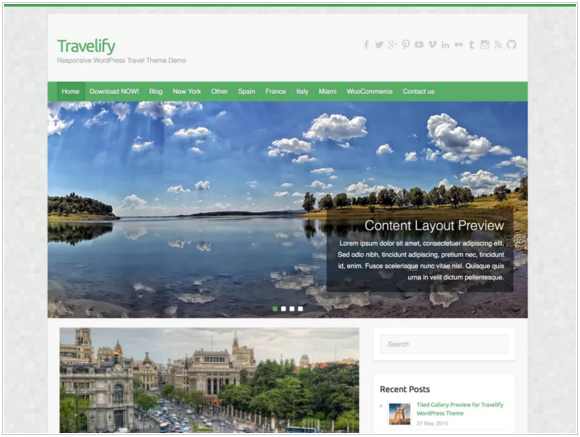 Travelify is a simple, responsive WordPress theme that was designed mainly for adventure, nature, language, and obviously travel blogs. This theme offers great customization options and features, including custom logo, featured post slider, social icons, and more. Quite amazingly, you can get this theme in English, French, German, Hungarian, Italian, Spanish, Dutch, Hebrew, Slovak, Turkish, Swedish, Brazilian Portuguese, Polish, Finnish, Bulgarian, Persian (Farsi), Greek, Russian and Chinese, 20 languages in all. 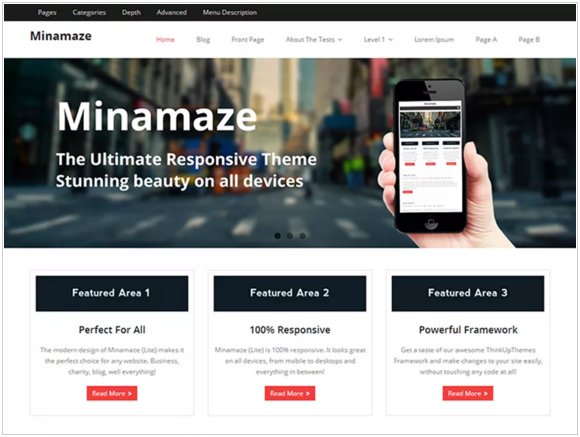 Minimaze is ideal for a business or blog website. 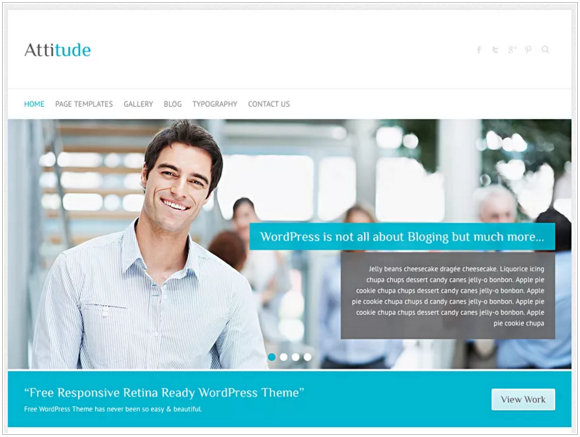 The theme features a responsive layout, full width slider, easy logo upload, and a built-in homepage template. 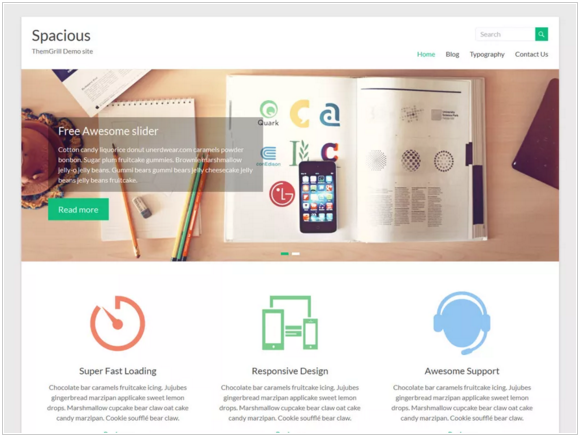 A powerful theme options panel also means you can customize your site to a good extent without touching any code. 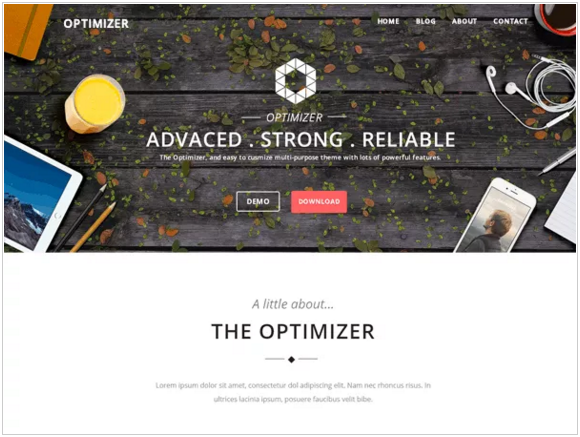 The Optimizer is a multipurpose theme, packed with many powerful features. You can customize this theme quite well without touching a line of code. Features such as full width or boxed layout, a beautiful image slider, easy logo upload, and many color options make this theme easy to customize and make unique. 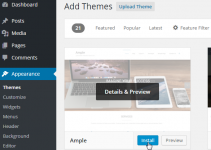 Ample is a multipurpose theme designed to give your blog a professional look. The theme design is simple and clean, and quite a few features are available to help you make your site unique, such as custom background, custom header, left or right sidebar, and theme options. This is another beautiful, simple theme by Theme Grill. Radiate was built with simplicity in mind, and so although you have the necessary customization options, they do not go overboard with features. Radiate is responsive, and you can customize the background, header, menu, and other features. Great collection of beautiful themes. I really had no choice but to feature your themes. Keep up the good work.